Saturday was by far the most thrilling day for our AC35 Endeavour Open sailors here in Bermuda. The morning began with a final practice race before VIP Rib transport over to the America’s Cup Village. They had some free time to explore the Endeavour “Education Station” which features fun and innovative STEAM related activities and learning opportunities. Next up, the kids were led backstage by Nevin Sayre. The big screen played an amazing video of the recent O’Pen BIC North Americans before the kids were brought onstage for their official introduction to the crowd as part of the Saturday Dock Out Show. 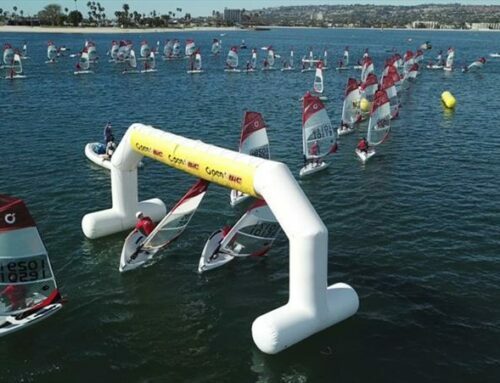 Once they made their on-land debut to the crowds, we hurried the young sailors back to the water to wait for their cue to begin the main event: the AC35 HALF-TIME SHOW! Once Team Emirates New Zealand and Oracle Team USA had both crossed, the crowd saw a sea of pink as the O’Pen BIC fleet made their way to the grandstands waterfront from nearby Lodge Point. 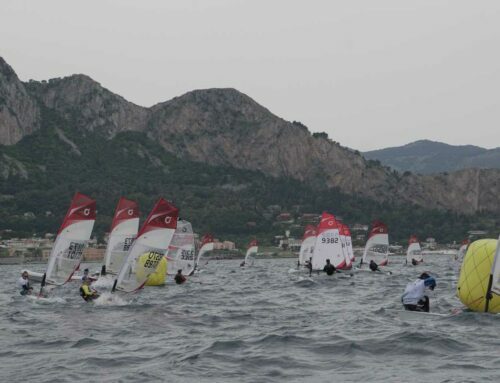 The crowd went wild for the “Un-Regatta” style race which featured an AC-like course plus, added slalom marks, and the “Bridge of Doom” limbo obstacle right before the finish. The crowd of 7,000+ in the Village were full of enthusiasm for the group as they navigated the course with lively commentating from AC announcer Tucker Thompson.